The second full moon of the month in astronomy is called the Blue Moon, which is not due to the satellite's shade, but to the idiom in English - "Once in a Blue Moon", which translates as "Once Upon a Blue Moon" and is equivalent to "After the rain on Thursday". This phenomenon occurs every 3-4 years, when the date of one of the full moons falls at the beginning of the calendar month, and the subsequent one comes just before the end of the same month. 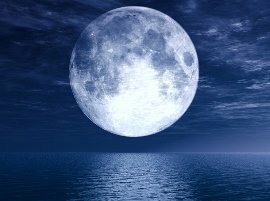 Usually in the year there are 12 full moons and each has its own name, the Blue Moon was named the 13th full moon, which sometimes happens in some years. In fact, in rare cases, the moon can acquire a bluish tinge. For example, on cold winter nights, when ice crystals in the air form a halo around the moon, there is a scattering of moonlight, which causes such an effect (the light of the blue part of the spectrum dissipates much better in the atmosphere in red). Also, an unusual shade of the moon may appear as a result of a volcanic eruption - for example, in 1883 there was an eruption of the Indonesian Krakatoa volcano, which was so powerful that the ash columns rose to the upper part of the atmosphere. Ashes particles absorbed waves of the red part of the spectrum, which led to the fact that the moon for several years seemed blue (sometimes - green). Volcanologist Scott Rowland of the University of Hawaii said that the sun was then lavender-colored, and the sunsets were so bright red that people in New York and some other cities called firefighters, suggesting a fire. One way or another, it is the rarity of such events (two full moons in one month, the moon of a bluish tinge) gave rise to the English saying "Once at the Blue Moon" - something that happens very rarely. City New York.